Chemical Control: Glyphosate + 2,4-D was found to be 100% effective when applied to pepperweed periodically over 3 months. (2,4) Please consult your County Weed Supervisor or Extension Agent. Read the label on all herbicides before use. 1. Lisa Lantz and Bridget Simon, Perennial Pepperweed (Lepidium latifolium), (online), available, http://www.nwcb.wa.gov/weed_info/pepperweed.html. 2. James A. Young, Ecology and Control of Perennial Pepperweed, (online), available, http://ucce.ucdavis.edu/freeform/ceppc/documents/1995_Symposium_Proceedings1796.PDF. 3. Government of British Columbia, Field Guide to Noxious and Other Selected Weeds of British Columbia, (online) available, http://www.agf.gov.bc.ca/cropprot/weedguid/pepperweed.htm. 4. Fred Bentler, Perennial Pepperweed (Lepidium latifolium), (online), available, http://dnr.metrokc.gov/wlr/lands/weeds/peppweed.htm. 5. 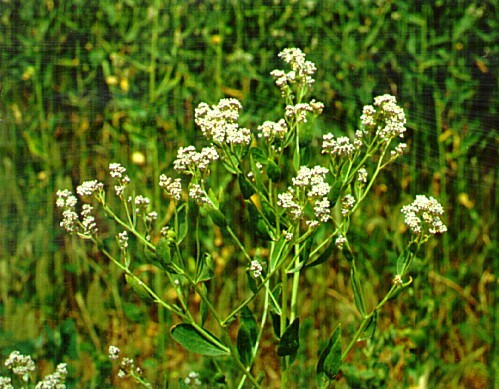 Yolo County Resource Conservation District, Perennial Pepperweed (Lepidium latifolium), (online), avaliable, http://www.yolorcd.org/weeds/pepperweed.shtml. By: Toby Marx and Jim Thorne 4/20/04. - Updated by Lizzie and Markie 3/09.